The first in series? Or some of the first in the series? The hell? 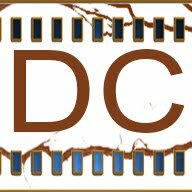 The series "Lone Wolf and The Cub" consists of six movies made in the early 70's (I'm citing IMDB for this), and Shogun Assassin is a 90 minute movie made from splicing together the first two movies in the series. Both of which are 90 minutes long. So... some of the first two movies? I guess. It makes no sense. But this is the review of the spliced together one. 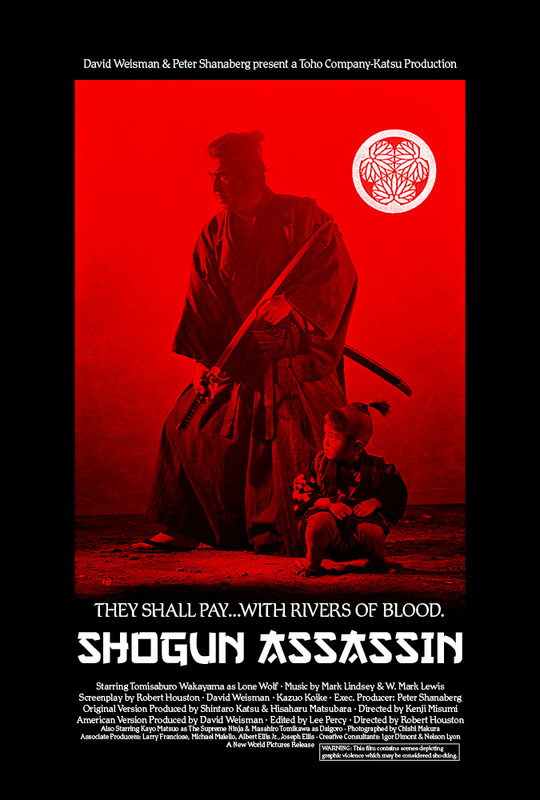 Dubbed into English (although there isn't exactly mountains of dialogue) Shogun Assassin is the story of "the greatest samurai in the Empire" (as told in narration by Cub, played by Akihiro Tomikawa, who was six years old at the time). The Shogun Assassin (or Lone Wolf, or Ogami Ittō), played by Tomisaburo Wakayama, refuses to bow down before the Shogun in servitude, and the Shogun has his wife killed (for reasons I'm putting down to bad dubbing, because I don't know why). So Lone Wolf goes on a rampage...sort of? And is hired as an assassin to kill other people? Basically after the first ten minutes or so (according to Wikipedia, the only content from the first movie in the series) the film transcends plot and becomes an 80 minute fight scene. You've, um, got something on your face. Just there. Yeah. You got it. 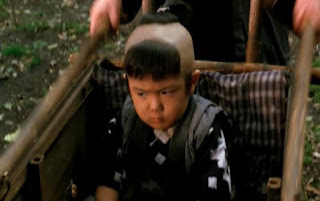 Consisting of silly, protracted fight scenes with Monty Python quantities of blood gushing from every cut off limb, Lone Wolf and Cub move from one set piece fight to another. They (yes, THEY) hack and slash their way through hordes of ninja, families of Shoguns and The Masters of Death. No wonder he looks pissed. 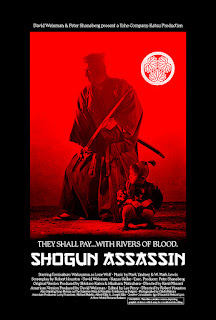 Basically without plot, Shogun Assassin is 70's martial arts at its finest, with no subtitles if they're not your thing. But don't expect a plot. Have a beer, and prepared to laugh. A lot.